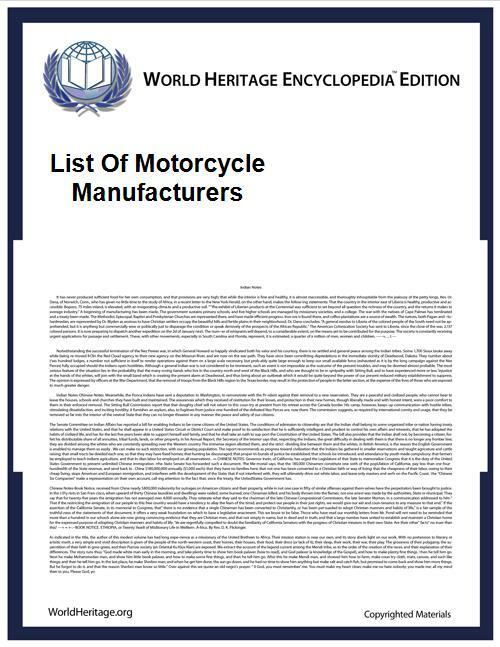 The following is a list of motorcycle manufacturers worldwide, sorted by extant/extinct status and by country. These are producers whose motocar are available to the public, including both street legal as well as racetrack-only or off-road-only motorcycles. The list of current manufacturers does not include badge engineered bikes or motorcycle customisers, but the list of defunct manufactures may include some of these if they are well remembered for their historical significance. This is a list of companies currently producing and selling motorcycles available to the public, including both street and race/off-road motorcycles. It does not include badge engineered bikes sold under a different name than their producer, nor motorcycle customisers. D.S. Unique Motors (Pvt.) Ltd. This is a list of companies that formerly produced and sold motorcycles available to the public, including both street and race/off-road motorcycles. It also includes some former motorcycle producers of noted historical significance but which would today be classified as badge engineered or customisers. It includes both companies that are defunct, those that still exist but no longer make motorcycles, and some that were acquired by other companies. ^ a b c The Triumph brand has had two distinct eras, one as Triumph Engineering Company, then under BSA at Meriden, and the recent one as Triumph Motorcycles at Hinckley, with ten years between the two. ^ The Norton company closed in the UK in 1976. The company reopened in 1995 in Portland, Oregon, United States manufacturing replacement parts and eventually new Norton models. The venture eventually required capital and was bought by Stuart Garner who intends to return production to the United Kingdom. ^ a b In 1928, Phil Vincent bought HRD and changed the name to Vincent HRD. In 1949, Vincent HRD was renamed Vincent. Production of Vincent stopped in 1955. In 1994, Bernard Li acquired the rights to the Vincent trademark, and in 1996 formed Vincent Motors, USA. Vincent Motors, USA, made 5 prototype motorcycles in 2002. The engine used in these motorcycles has since gone out of production and Mr. Li has since died. It is therefore not likely that series production will begin.